In the crisp morning air with dew lifting from grassy meadows, seven riders, four pack horses, and two guides headed out for Goat Camp. This is not just a ride, it is a journey back into a time when you could ride for days and see no one. We rode in silence through a grove of quaking aspen to a rocky shore of the Chilko Lake to water the horses. The trail to Goat Camp is infrequently used each season and feels a bit like bush-whacking. It snakes through alder thickets and then begins to climb. Our sturdy, sure-footed horses took on the steep ascent with aplomb. Check out the views from riding at Tsylos in this video, filmed by a Tsylos wrangler. Josh, our accomplished guide, encouraged us. “Stand up. Get out of the saddle. Grab mane if you have to! You don’t want to sore up your horses on the climbs.” He was gentle with the animals and displayed a kind spirit and a helping hand to guests. With our safety in mind, he checked cinches and made sure all was secure before leading us along narrow tracks overlooking a charging river, splashing through creeks, and clamoring up and down steep ravines. After breaking for lunch in a lush meadow peppered with purple lupine, we continued on to reach Goat Camp at 6,800 feet elevation. We had climbed 3,000 feet and now the air was crisp with temperatures hovering around 70 degrees. This magical setting was to be our home for the next three nights. I awoke here to the energetic voice of Pink Creek (so named as the minerals from the glacier feeding the stream turn it a salmon color). A favorite day ride was up the emerald green valley and across Pink Creek to its headwaters. Chartreuse alpine sedges and mosses lined the shore where it merged with a translucent glacier flow. The day ride without the pack horses to the top of the world is nothing short of spectacular. We charged through boughs of Jack Pine keeping a sharp eye out for trees that can catch and bruise a knee. The forest floor was a carpet of salmonberry, devil’s club, huckleberry, cinquefoil, paintbrush, columbine, rock rose, and lavender asters along with many varieties of ferns and mosses. We hopped a sparkling rill stealing through an alpine meadow and began the switch-backing trail through loose scree. Once aloft at about 8,000 feet, the air became rarified. The head-spinning 360-degree view of snow-frosted peaks and the azure Chilko Lake below was worth the climb. On the descent back to the lagoon, I dreamed of the cooling dip awaiting me. That night we were graced with a bold blood moon with a rosy halo. I felt privileged to be here in one of the great wilderness areas of North America and to have experienced it in such a special way. After contentious conservation battles that lasted years, the rights to this region were given to the First Nation people in 2004. It is my hope that they will continue to choose to preserve this land that is held sacred by them. Pack trips to the Potato and Goat camps only go out a couple of times a season. 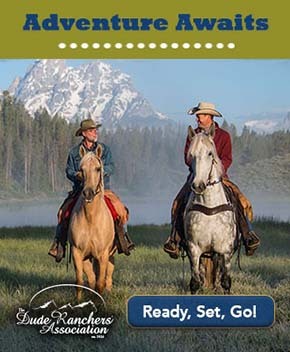 They call for a modicum of fitness, a willingness to help others, the ability to tack your own horse, and a desire to see this gorgeous region up close and personal. 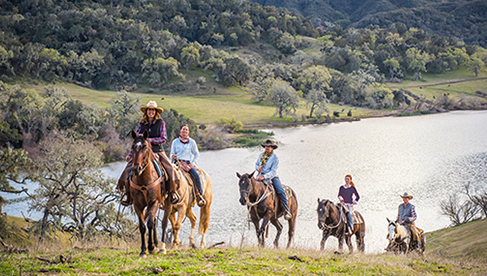 The undulating 25-mile ride back to the lodge through forests of fir and sun-drenched wildflower meadows is a fitting finale to the week on horseback. If you prefer shorter rides with lodge comforts that include gourmet meals and a spa in the deck overlooking the pastoral valley and Chilko Lake, “lodge riding” might be a perfect fit for you. Riders from around the world seeking the most authentic riding experience gather here forming a stimulating international crowd. Many do the two-week combination with one week-long pack trip and one week of lodge riding. Non-riders come to Tyslos for fly-fishing. A 21-mile float down the Chilko River garners rainbow trout, bull trout, and salmon in the fall. Photographers from around the globe gather here to capture images of the over 100 grizzly bears that call Chilko Valley home during the fall Sockeye Salmon run. Autumn is a lovely time of year to be here when the aspen trees are spinning gold. Whatever your reason for coming, you will never forget your stay at Tyslos Park Lodge. That it exists in this remote region is a testimony to the resilience and fortitude of the McLean family. Many others have tried and failed to tame the Chilcotin Plateau—a land of extremes and endless beauty. I suggest the Pacific Gateway Hotel located near the International Airport in Vancouver. They have a free shuttle to South Terminal where you catch the charter flight to Tyslos Lodge, as well as to the International Airport. About the Author: Linda Ballou is the author of The Cowgirl Jumped Over the Moon. You will find numerous travel articles on her website.